True confession time: I’ve become kinda a geek about DNA. At first, it was just a way to really understand my heritage. 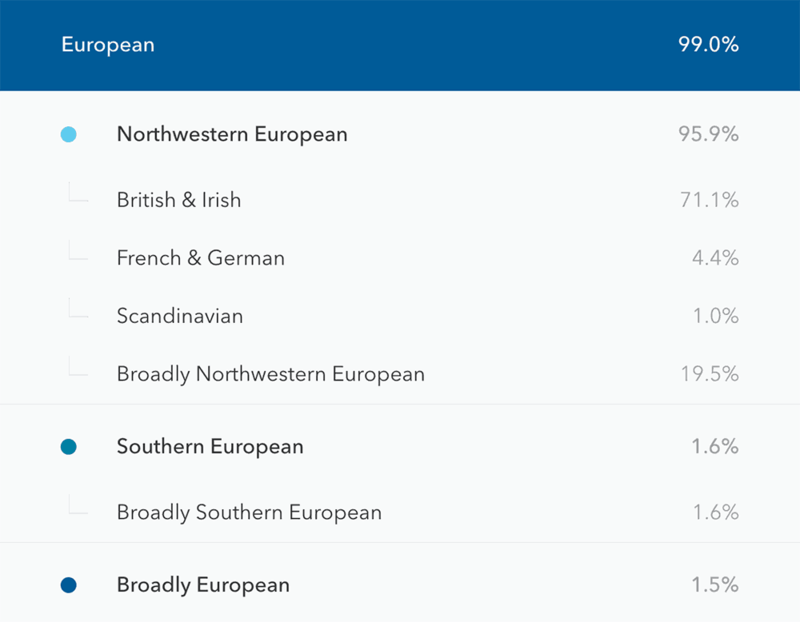 It would seem that my family on both my mother and father’s side is pretty much either British or Irish and I wanted to know if that was really true. So I took an AncestryDNA test. I wasn’t crazy about the results I got from my AncestryDNA test. They seemed overly broad and didn’t really jive with the few facts about my family that I know. And I’ve become interested in the many ways we can use DNA now to understand our current health and any future health issues we might have. 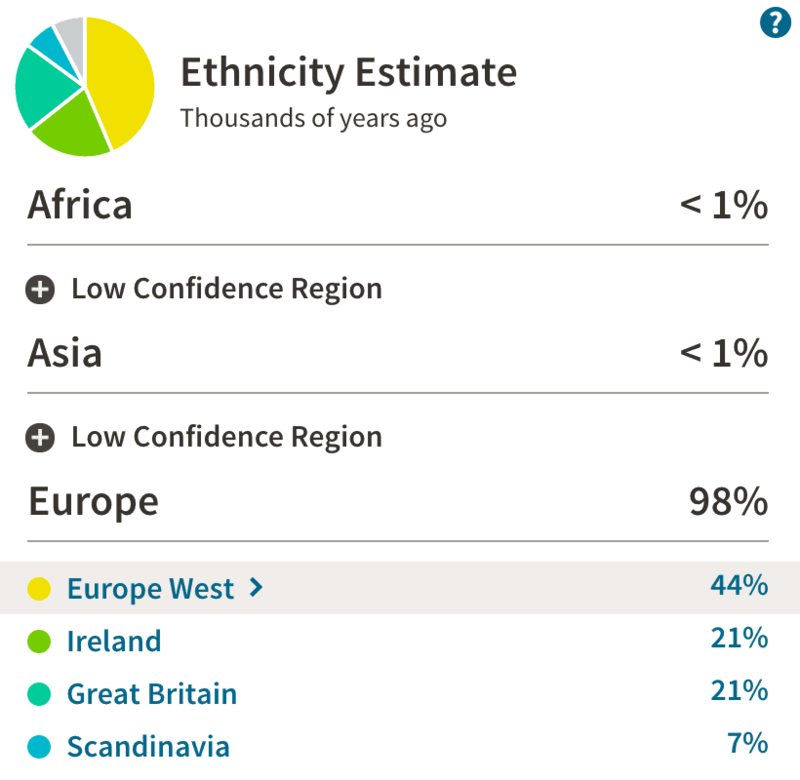 AncestryDNA doesn’t provide this information so I started to be curious about what I could learn from a 23andMe test. Would it match up with my Ancestry results? What would I learn about my health? I finally broke down and bought a 23andMe Health & Ancestry DNA test on Amazon Prime Day when they were 50% off and I could at least justify my purchase because it was such a deal! After spending time with the results of both tests, I can see that there are pros and cons to each. So which one is right for you? Both AncestryDNA and 23 and Me run frequent specials. I’ll update current prices in this section so you can always know how to get the best price. 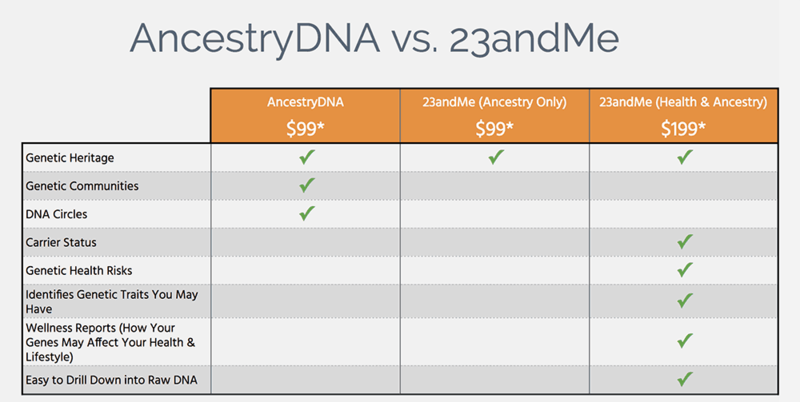 AncestryDNA – The price of the kit right now is $79, $20 off the normal price of $99. You can also get free shipping on your kit with the code FREESHIPDNA. Plus! If you are an Ebates user or you sign up for an Ebates account before making you buy, you’ll get a rebate of 7.5% on your purchase. 23andMe – The ancestry and health reports are currently $30 off until January 31. You’ll pay $169 rather than $199. The following chart shows the price of each test and what tests are included. Let’s break these down and see how each test performed. I am shockingly undiverse which is a disappointment but not really a surprise. The surprise was the 44% Europe West (defined as Belgium, France, Germany, Netherlands, Switzerland, Luxembourg, Liechtenstein). I’ve taken my family tree back several generations now and I’ve yet to find a relative who isn’t either English or Irish. So who are these Western Europeans? That makes a bit more sense to me. I’m still about as European as they come, but I’m mostly British & Irish. 23andMe also provides a handy timeline showing your most recent ancestor from each population. If you want to further investigate your heritage, you can check out the ancestral origin of different parts of your DNA, your maternal haplogroup (which is basically your lineage back to your original maternal African ancestor – super cool), or find out just much of your DNA comes from Neanderthals (not as ludicrous as it seems. Apparently, your Neanderthal DNA can influence a whole host of conditions). Fewer Neanderthal variants than most people. So I’ve got that going for me. My Recommendation: If you’re just looking for broad strokes, then AncestryDNA is just fine but if you want to dig really deep into your genetic heritage, you’ll enjoy 23andMe. Genetic communities are a unique feature of AncestryDNA. By analyzing test results from each AncestryDNA member who is connected to you via DNA, they are able to identify a population of common ancestors from which you have most likely descended and the area of the world in which your ancestors lived. I’ll have to be honest here and say I really don’t get a lot out of this. It’s not really a shock to me that my ancestors came to the south and then never, ever, left the area (including me – I still live in Georgia.) You can’t drill down on the blobs and that would actually be of interest to me – to find out which of my possible ancestors were represented here. Still, as they improve this feature, it may become more interesting. My Recommendation: If you like this feature, you can only find it at AncestryDNA. DNA Circles are also available only through AncestryDNA and they are invaluable if you are interested in tracing your family tree. DNA Circles identify common ancestors you share with other AncestryDNA members. Once you do that, you can browse their family trees (if they’re public). I was able to add a good bit of information to my family tree by browsing the DNA Circles. I currently have 15 DNA circles to investigate and can’t wait to check them all out. My Recommendation: If you’ve purchased an Ancestry.com membership to track your family tree, this feature makes your research so much easier. AncestryDNA alerts you to living relatives who share your DNA, along with an estimate of how closely you’re related, and shows you the ancestors you share in common, as well as any DNA Circles or Genetic Communities you share. You can identify common ancestors or reach out to a distant cousin you didn’t know you had. AncestryDNA also a new feature that I’ve really loved: it identifies potential ancestors that aren’t currently in your family tree. In my case, this opened a whole new world on the Wilkerson side of my family (my Dad’s side). I hit a roadblock pretty early on and couldn’t find any relatives above my grandfather. AncestryDNA identified John J. Wilkerson as my second great-grandfather and from there I was able to fill in a ton of holes. I still have avenues of research I haven’t explored. 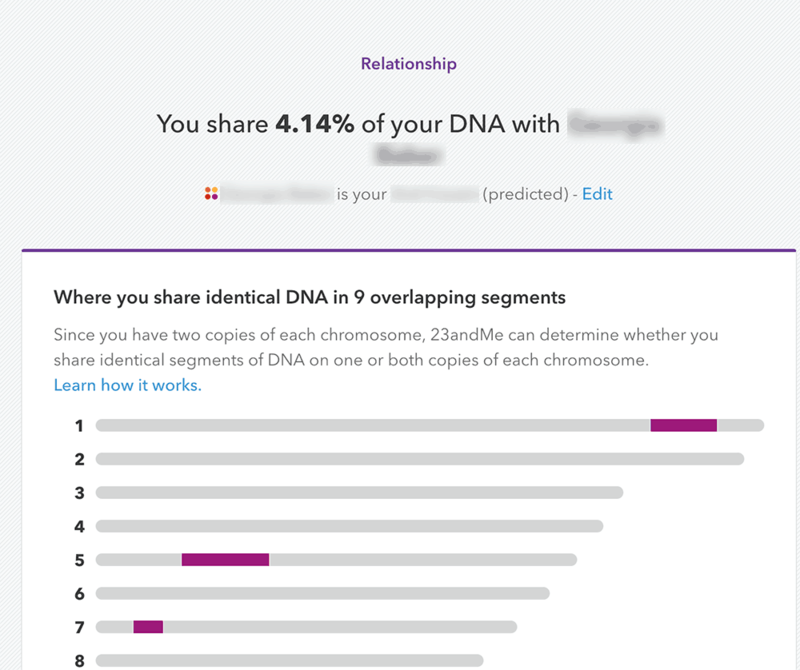 23andMe also identifies potential relatives for you. (I laughed when I compared the list of relatives from 23andMe to the list from AncestryDNA. It turns out that I’m definitely not the only person who’s taken two DNA tests! Or perhaps that’s a family trait – maybe we’re all just extremely curious.) But its approach is quite different from AncestryDNA. 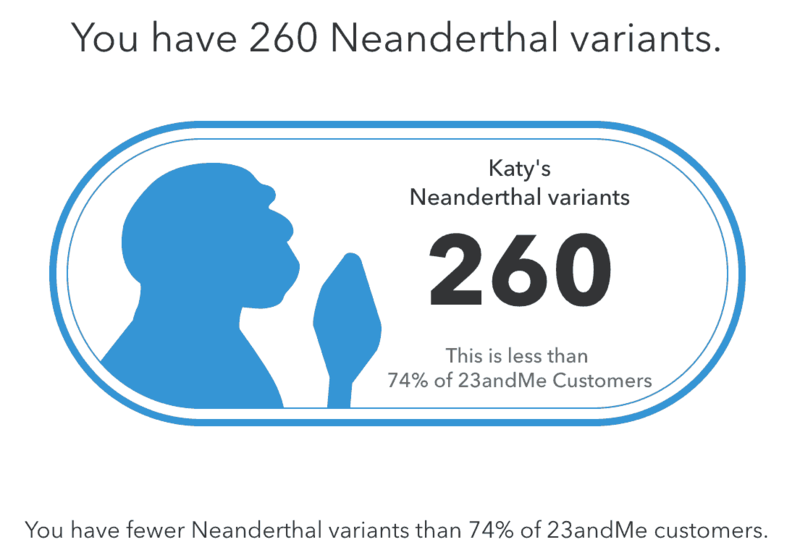 Instead of focusing on what ancestors you share your relative, 23andMe focuses on what DNA the two of you share. This feature doesn’t really have a lot of value for me personally, but I can see where it would be invaluable if you were trying to track a hereditary condition. You can also see the family trees of any relatives who are sharing them but it seems like very people (of my relatives at least) have them. The tree is stored at myheritage.com and it doesn’t seem as easy to navigate as Ancestry. 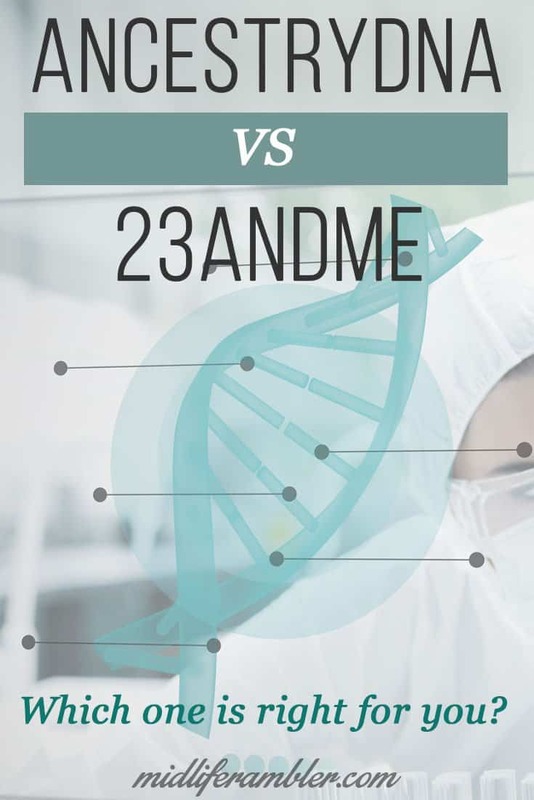 My Recommendation: If you’re looking to contact relatives, then AncestryDNA is the best solution but if you are researching a genetic condition, then you’ll appreciate 23andMe. Now we’re getting to the areas where 23andMe really shines. If you’re looking for health reports, AncestryDNA doesn’t provide any information. Carrier Status (42 Tests) – What genetic conditions might you pass on to your offspring. 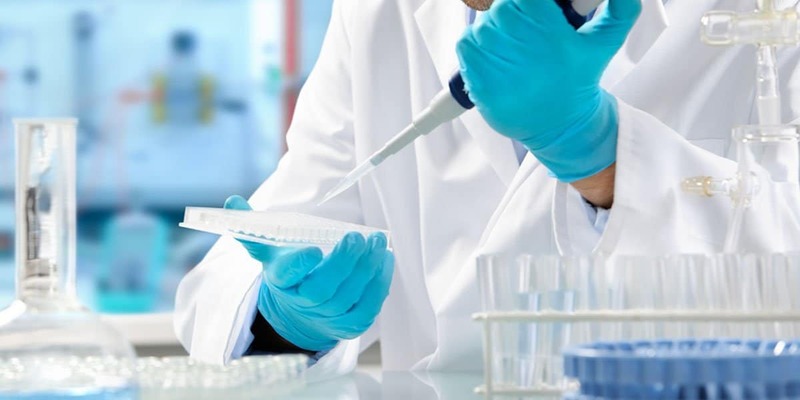 Genetic Health Risks (6 Tests) – What genetic conditions are you at risk of developing. Traits (19 Tests) – How your DNA influences your physical appearance, preferences, and physical responses. Wellness Reports (8 Tests) – How your DNA influences your body’s response to your environment. Here’s the fun part of the 23andMe Health Reports. 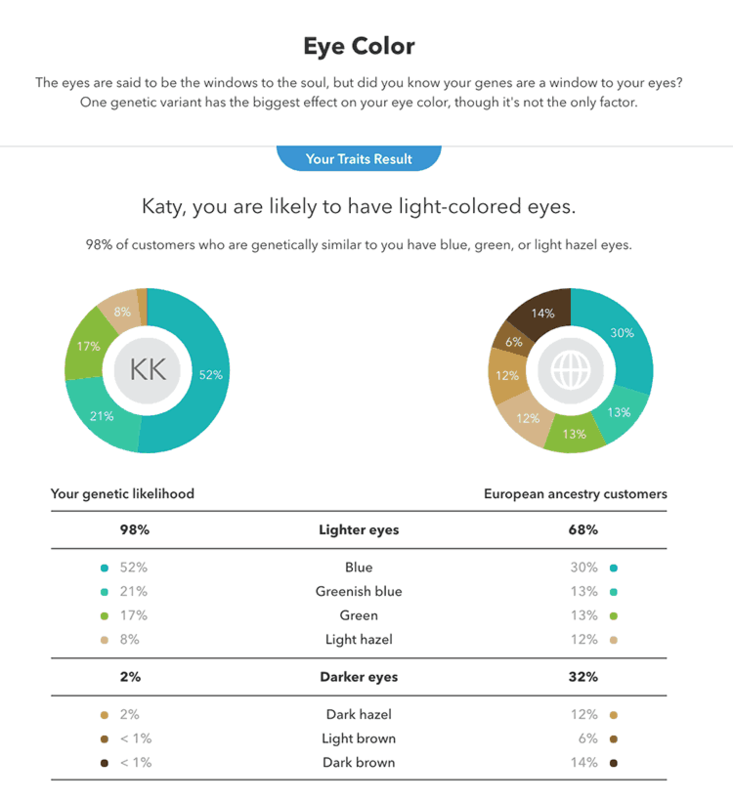 23andMe reports on 19 things you probably already knew about yourself (can small asparagus, likely to have light eyes, etc.) and then shows you why that’s the case. For example, if you saw me you’d see that my eyes are blue, but would you know that due to my genetics, there’s pretty much no way I could ever have brown eyes? Well, now you do. 23andMe will also provide advice for maintaining a healthy weight based on your genetics. For example, I am slightly more likely to weigh more than average. (I blame you, Dad!) But, if I limit fast food, step up the exercise, and cut down on red meat, I can mitigate my genetic destiny. My Recommendation: Only 23andMe offers Health & Wellness Reports so if these reports are a must have for you, you’ll need to go with 23andMe. However, keep reading because you have some options. 23andMe offers the ability to examine your DNA directly. 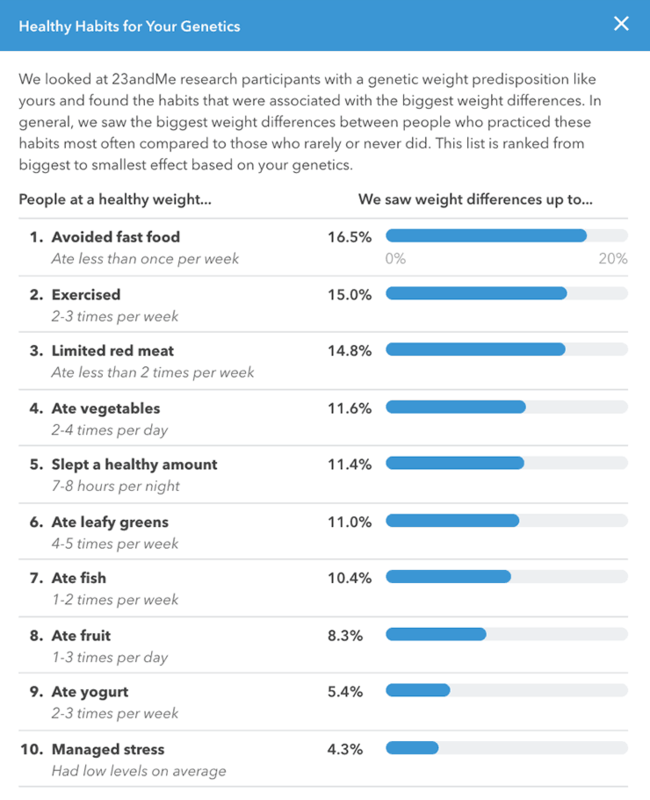 For example, I recently read an article online about two different genes can affect your ability to truly feel full (low satiety) and wanted to check if I had either of these markers. I was able to check quickly to see if I had either of these. So Which Test is Right for Me? Well, it depends. Are you looking find out your heritage and help complete your research into your family tree? You’ll probably get the most benefits from AncestryDNA. If you’re more interested in analyzing your health, then 23andMe is right for you. What if you’re interested in both your heritage and your health? You may still not need to purchase a second DNA test. Both AncestryDNA and 23andMe allow you to download your DNA information or allow a third-party tool to access it. I’ll be providing an overview of other DNA analysis tools in a future post. You can order your test at AncestryDNA. The regular price of an AncestryDNA test is $99, but they regularly offer sales as well as discounts on extra tests and Ancestry.com subscriptions. If you choose to order from Ancestry DNA, be sure and look for an Ebates coupon. You can frequently get a refund between 5-8% if you purchase through EBates. You can also order your AncestryDNA test through Amazon and if you’re a prime member, you can get it within two days with free shipping. You can order your test at 23andMe. The Ancestry-only test is $99 and the Ancestry & Health Reports generally run $199. They occasionally offer deals such as free shipping or rebates through Ebates but not as often as AncestryDNA. Definitely, check out the prices for 23andMe tests at Amazon. You’ll get quick, free shipping if you’re a Prime member and I got my 23andMe test at an amazing 50% off on Amazon Prime Day. They may run another similar special closer to the holidays. I know! Me too so thanks for sticking through to the end. I hope this helped you decide which DNA test is best for you. I’d love to know your experience – please share in the comments! Great article! The comparisons were well stated and the use of personal examples to back up your preferences is much more appealing than a dry product description.